Coming on the back of her comeback single ‘All In Me’, which was recently premiered by The Line Of Best Fit, and met with rave reviews from fans and critics alike, South East London singer, songwriter and musician LAOLU is proud to unveil the dark and gripping avant-garde music video for ‘ALL IN ME’, as premiered via NOCTIS Magazine. 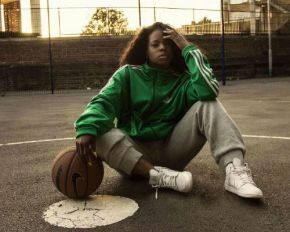 Taken from her forthcoming debut EP of the same name, ‘All In Me’ is Laolu’s first offering in nearly three years, having been forced to quit music due to her battles with depression. I focused on having this ‘Ego’ character, which represents depression, hover and mimic me in a way, because depression can be very evil, it can manifest in your thoughts sometimes constantly attacking you, you beat yourself up and aren’t good to the real you. I focused on how depression can seep in slowly - on some days when you think you’re having a good day then out of nowhere, your mental space is just clouded with negativity and it’s very scary.